3. 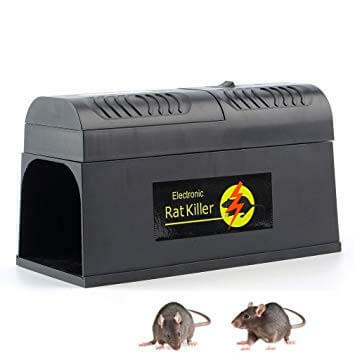 Works by giving a powerful electronic shock that kills the rat, an alternative to toxic chemicals and dangerous traps. 4. Compact cage-unit doesn’t occupy a lot of room. 5. Designed with safety protection switch, in order to prevent mistake electric shock to person. ★HUMANE RAT CONTROL – The electronic rat and mouse killer runs only on electricity – no poison, no more clumsy traps. This sleek pest control device catches and instantly kills pests in a humane manner. Fantastic rodent control , at the press of a button! ★RAT or MOUSE Or Even MICE : Size is no problem with the electronic rat killer. Can trap and kill rats and mice of any size! The detachable tray is washable, allowing for easy cleaning once the trap has done its work. Pest control does not come any easier ! ing rat problem, very informative. the information provided in the do it yourself kit was so helpful, my rats are all gone. I’ve had a rodent problem for about a year now and my methods just could not solve my problem , I am senior citizen and I gave this kit to my handy man and he followed all the directions on the do it yourself kit kit and my rats are gone. The do it yourself kit has helped me so much with my rat problem , it’s a solution in a box. Highly recommended. The RSRTK is smart and easy to use, information that you will never think of. Very helpful. Basically a bible for solving a rat problem. Tthe do it yourself kit is very easy to follow and provides information that really solves the problem. Rodents stop do it yourself kit has been extremely helpful on getting rid of my rats. Very informative stuff. the kit was very helpful , so much detail about rats and how to control the problem. The kit was very helpful, so much detail about rats and how to control the problem.